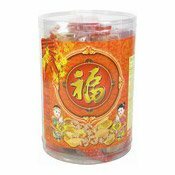 Description: These individually wrapped crunchy pastries are ideal for Chinese New Year. Ingredients: Wheat Flour (30.2%), Sugar (29.8%), Peanut (17%), Palm Oil (6.8%), Water (6.8%), Sesame (4.5%), Modified Corn Starch (2%), Shredded Coconut (1.5%), Shortening (1%), Salt (1%), Baking Powder (Raising Agent [E500. E341], Corn Starch) (0.5%). Simply enter your details below and we will send you an e-mail when “New Year Dumplings (So Kwok, Jiao Zai) (角仔 (桶裝))” is back in stock!